You’ve heard it — or maybe even said it — so many times that the mere mention of team can be perceived by your staff as nothing more than lip service. You can almost hear the empty promise: “Sure, coach, I’ll pitch in for the team.” Yeah, right. In this business, too often it’s every person for him or herself. Clock in. Pocket the tips. Call it a night. Part of the problem is that the word “team” means something different to everyone you try to coach into participation. Restaurant teams have their own definition. Think about it. Do you believe that any group that works together is a team? Not always. Another misconception is that “teams” and “teamwork” are synonymous. Sure, they’re related, but “teamwork” more appropriately describes behaviors that can help individuals and organizations as well as teams: listening to others, responding constructively, giving others the benefit of the doubt and supporting people who need support. So if a team isn’t just a group of people, and it isn’t people practicing “teamwork,” then what is it? A team is a small number of people with complementary skills who are committed to a common mission for which they hold themselves mutually accountable. 1. Small number. Most successful restaurant teams have two to 25 members. A larger number – say, your restaurant’s entire staff — will have difficulty interacting and making decisions. Ten to 15 people find it easier to work through their differences toward a common goal. Your best bet is to think of your restaurant as a series of related teams: front of the house, kitchen, management and a variety of sub-teams. Technical expertise. They have to first be able to get their own job done. Problem-solving and decision-making skills. They must know how to evaluate problems, plan strategies and make decisions. Interpersonal skills. They need to be able to state their opinions clearly, listen actively and provide helpful suggestions. 3. Common mission. Each member’s immediate tasks must relate to the team’s overall purpose. If short-term objectives don’t match the long-term picture, team members will feel confused and discouraged. 4. Mutual accountability. A group becomes a team only when it can hold itself collectively responsible. This article was excerpted from the popular All for One: 52 Ways to Build a Winning Team restaurant management book. 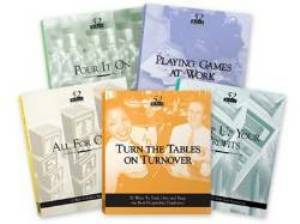 Our “52 Ways” book series provides one idea per week to solve some of the toughest restaurant management challenges. Books cover topics of employee incentives, staff turnover, cost-cutting, teamwork, and bar profits. Each book contains 52 easy-to-implement ideas – one idea for each week of the year. Click here to get started today!